MightyCall gives you a variety of choices on how you want to call, including the revolutionary webphone. With the webphone, you can use your business number to communication with staff and clients straight from computer – no phone needed. All you need to use the webphone is a computer and internet access. On your MightyCall account page, simply turn on your webphone (it’s inactive as a default setting) and you’re ready to go. From there, you can make any outgoing call you want, and incoming calls have instant notifications so you can leave the webphone up in the background. The webphone is also the cheapest way to use MightyCall. When making and receiving calls through it, you aren’t using your service provider minutes – only your MightyCall minutes. This makes it perfect for small offices. If you’re the boss, you can command everything straight from your desk. Any missed calls and voice messages automatically get added to the integrated task list so you can easily respond to them as soon as possible—and with the click of a button. And if your company has a particularly heavy call flow, using the webphone is an excellent way to delegate and make sure your team covers everything. Better yet, the webphone is available for anyone in your office to use, helping to organize both internal and external communications. There is even a built-in contact directory with all the users, saving you the work of inputting or memorizing numbers. The webphone packs the power of a computer with the same feature functionality, letting you transfer calls, form teleconferences, alternate conversations, put callers on hold to consult with employees, and more with ease. With MightyCall you can also use external software telephone, for example, X-lite. 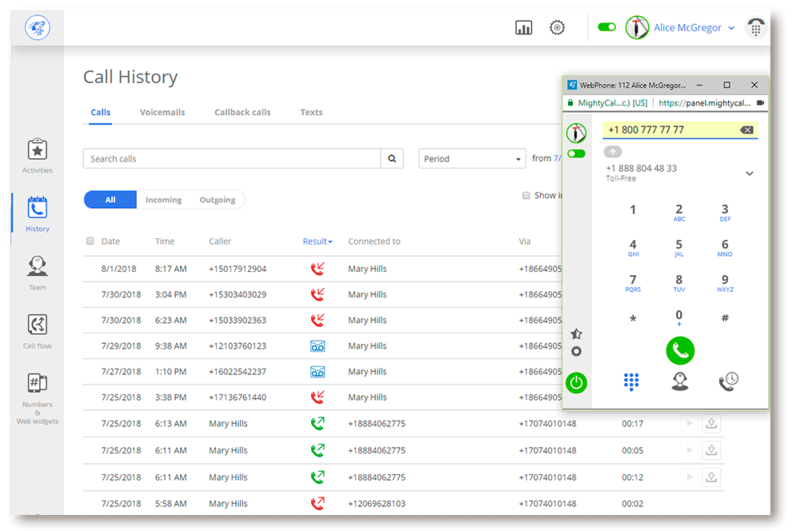 MightyCall application supports receiving and making calls on behalf of your business number.